Here is a sauce recipe that pairs well with the stronger flavor of divers. The whole wheat pasta adds an excellent texture and slightly nutty flavor when paired with the sauce. Toss in a red wine with some heart to counter the flavor of the Swiss chard. If you have no ducks, I have also used crumbled cold smoked sharptail grouse, added directly to the sauce as it reaches simmer. If you are out on the prairie or at a remote duck camp with no Swiss chard, dandelion greens blanched prior wilting also will work, as will baby spinach (texture will be different, as will the flavor of the sauce compared to Swiss chard). If you use dandelion greens, cut the volume by a half to a third, since they are quite a bit stronger than Swiss Chard. This takes about an hour to bring to a finish and serve. Add two tbsp. of olive oil to a fry pan with a cover. Over medium high heat, cook one shallot and one bundle of green onions, both fine chopped, until tender along with 2-3 cloves of freshly minced garlic. Chop one to two washed and de-stemed bundles of red Swiss chard leaves into roughly two inch squares( I usually make the equivalent of about 7-10 rough packed cups) and add to pan over medium heat, stirring until they wilt (about 6-8 minutes). Add six to eight ounces of tomatoe sauce, 1-2 16oz. cans of diced fire-roasted tomatoes, (depending on the volume of Swiss chard used). Add a half-cup of pitted Calamata olives sliced lengthwise and 1/3 tsp. of red pepper flakes. Add 2 to 3 1/2 Tbsp. of roasted pine nuts-again depending on sauce volume. Add coarse ground black pepper to taste. The red pepper and ground black pepper lend an excellent background taste to the chard. Cover and simmer until the chard leaves become tender-about ten to fifteen minutes over medium-low heat. Cook one package of Whole Wheat thin spaghetti to al dente and serve. Cut diver breasts into roughly one 1 - 2 inch chunks roll in Italian bread crumbs and fry to taste (I recommend medium rare) in olive oil. I usually chop these up and then throw them in a Zip-Loc bag with the bread crumbs and then start the sauce. Immediately prior serving, sprinkle 1/1 Cup of Pecorino cheese over the simmering sauce; then serve. Grate another 1/4 to 3/4 cup of Pecorino for the table,again, dependant on number of servings made and guest size. Here is a "quick and dirty" diver recipe: mix a 3/4:1/4 Progresso Italian Bread Crumbs and Drake's batter mix in a gallon Zip-loc bag. Add 1/2 tsp of dried basil. Drop four redhead breasts in and coat via rolling the bag. Place in refrigerator until ready to pan sear. Make a red wine reduction by slowly simmering a cup of Cabernet Sauvignon down to 1/3 its original volume. Sear duck breasts in olive oil coated fry pan for roughly five minutes per side to medium rare serving consistency. Melt 2 Tbsp. of of currant jelly into the red wine reduction prior serving as a sauce. Serve by drizzling the red wine/currant jelly sauce over the breasts. I made long grain and wild rice as a starch and fried-up some shaggy mane mushrooms I picked fresh. This worked well for me with buffleheads. Probably one of the worst tasting ducks. 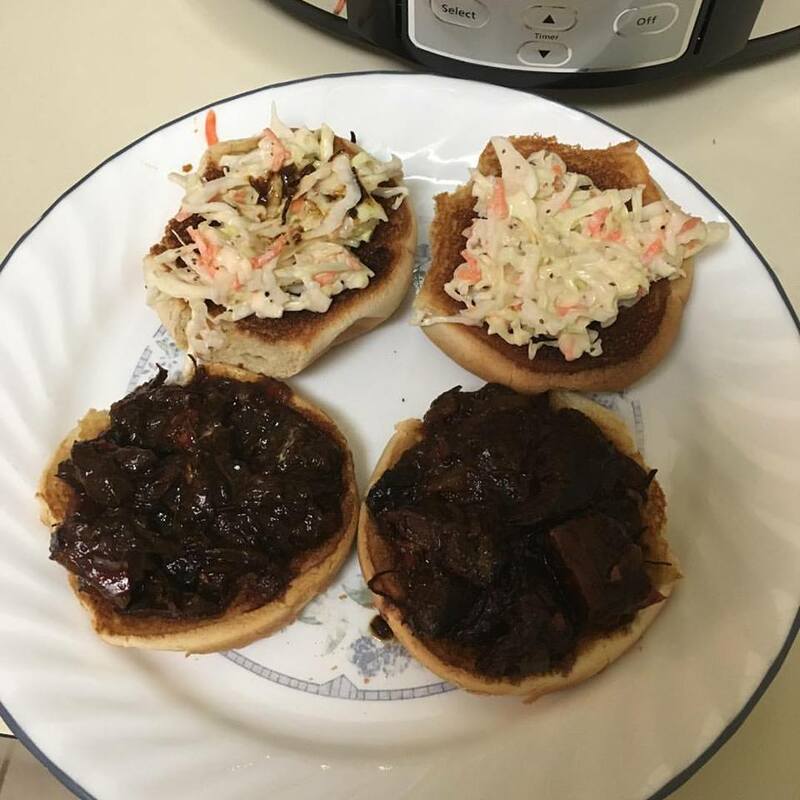 Serve on toasted buns with fresh coleslaw.